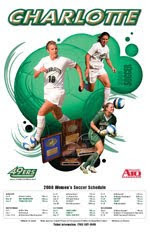 The Charlotte 49ers women’s soccer team, who have won three straight Atlantic 10 regular season and two straight A-10 Tournament titles, were picked to finish second in the preseason poll which was voted on by league’s 14 head coaches. Dayton, who reached last season’s A-10 Championship game, is the preseason pick to win the Atlantic 10. Saint Louis, Fordham, Rhode Island and St. Bonaventure round out the top six teams in the preseason poll. Charlotte is hosting the six-team Atlantic 10 Tournament at Transamerica Field, Nov. 5-8. Charlotte, who finished the season nationally-ranked, reached the second round of the NCAA Tournament with a school-record 18 wins. The 49ers welcome back 10 starters and 21 letterwinners from last season led by preseason All-Atlantic 10 selections senior midfielder Hailey Beam, who was recently named to the Hermann Trophy Watch list, and juniors defender Whitney Bryant and Whitney Weinraub. Charlotte opens the 2009 season at 4 p.m. Aug. 23 at William & Mary. Charlotte faces Appalachian State in its home opener at Transamerica Field at 7 p.m. Friday, Aug. 28.